We will make cushions according to your order or notify us your requirement by contacting us (Use "Contact Seller" Link). The Cushions are made out of sunbrella fabric which is the best for outdoor for moisture and mold. You can choose any fabric from sunbrella fabric collections excluding premium fabrics, Cushions on this bench are 2.5" thick. comes with zipper and ties on back. If you need more thicker or extra work added like piping, please let us know. Inside material is 80% foam and 20% polyster. The Cushions are filled with 100% Foam to maintain their shape for years.. All the Cushions come with a zipper in the back side and ties if needed for easy removal when needed, you can remove inside foam material and wash cover when needed. Rich solid colors and stylish patterns to give your outdoor furniture new life. Covered in all-weather, easy-clean, colorfast Sunbrella ® fabric that repels water and resists chlorine, soil, and stains. 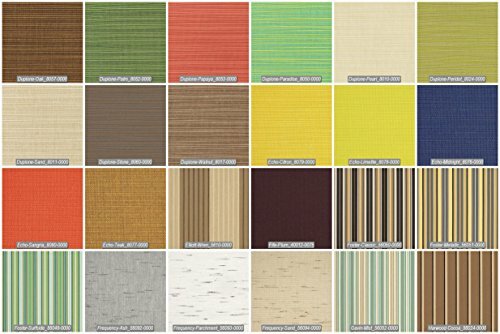 ****NOTE: Some of the fabrics on sunbrella website are premium fabric which are very expensive, may need to pay extra cost, Normally 4 digit code fabrics are normal fabrics and in the price range mentioned in the item description. Seats cushions are 2.5" thick, need more thick or piping, please contact us. Simply notify us fabric color/pattern of your choice by contacting us(Use "Contact Seller" Link). If you have any questions about this product by TeakStation, contact us by completing and submitting the form below. If you are looking for a specif part number, please include it with your message.